Innerspring – Composed of steel coils in various configurations, these are the most traditional and most widely sold mattresses. Most have between 600 and 1,000 coils, and some may have foam layers or pillow-top cushioning added. More coils do not guarantee superiority, though, because they may be made of thinner-gauge metal. Memory Foam – Mostly made of polyurethane or latex foam, these are favored by people with back pain because the foam softens and molds to your body when you lie on it and springs back when you get up. Some owners say it “sleeps hot,” but newer variations infuse gel to keep it cool. Adjustable Air – These are inflated with a pump at your bedside to suit your desired firmness. 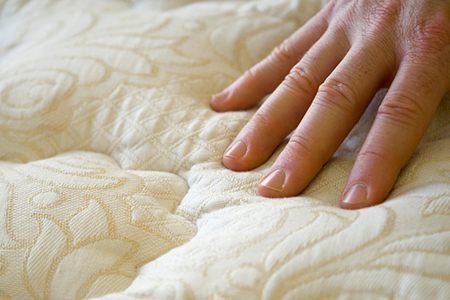 Foam layers are added for more comfort, and each side can be adjusted to suit the comfort of bed partners. Know the Return Policy – Most stores offer a full refund or credit toward another mattress for a couple of weeks to 120 days from purchase, although some will require a re-stocking fee—but you’ll be responsible for the return and any damage. You Can Haggle – While some warehouse stores and other low-price leaders are pretty firm on price, most retailers will come down a bit on the price. Understand the Warranty – It may range from 10-25 years, but coverage is sometimes pro-rated, decreasing over time. Do You Need a New Box Spring? – If you’re switching to a foam or adjustable air bed from an innerspring, you’ll need a boxy foundation that lacks springs and wire. Otherwise, if your box spring isn’t broken and is still structurally sound, consider keeping it and saving money.